The Peak Units field contains the number of units or percentage to which a resource is assigned at any one time for tasks as distributed over time. The value in the Peak Units field represents the maximum effort a resource is working on an assignment in the given time period. Peak is an assignment field and resource field, indicating the highest percentage possible to use this resource (on this task). 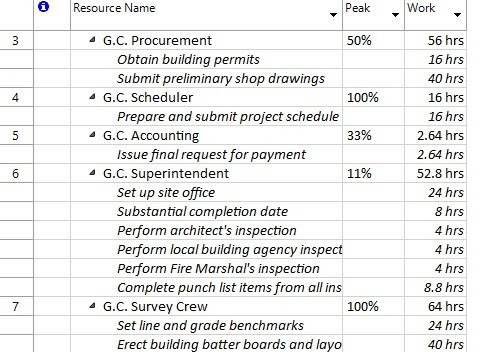 Peak units are the highest level at which a resource is scheduled for all assigned tasks during a given period of time. Peak units field is calculated and it shows the percentage for the highest (peak) within the assignment. Like maximum units, peak units are expressed as percentages for work resources. For material resources, peak units are expressed as a decimal together with the material label (for example, 40 tons/week). Peak usually follows the assignment units. Reviewing peak units can help you determine whether a work resource is underallocated or overallocated during a certain period of time. For material resources, you can compare the peak units (the largest consumption rate needed during a certain period of time) with the rate at which the supplier can deliver the material. If a resource's Peak Units exceed Max Units, the resource will be shown as overallocated. Add the Peak field to the table part of the Resource Usage view to see the total peak units for the resource for all assigned tasks. You can also see peak units in the Resource Graph view.